Lance Avery sells four different types of pastured, heritage pork sausage made with bacon under the Big Forks Brand. He recently served them on a stick at the Good Food Festival. Much of the food world has recently descended on Chicago for a rare convergence of international food conferences. Last week it was the Conference of Women Chefs and Restaurateurs followed by the Good Food Festival overlapping with the International Association of Culinary Professionals, which wrapped up yesterday while the International Home and Housewares Show continues through today. Phew. I sampled my way through three days of them and came out stuffed, but also excited by some fresh new takes on bacon, burgers, kale, lentils and even some local shrimp. Yes. You heard it. He was serving bacon sausage on a stick. Wipe off the drool. I asked why he combined bacon with sausage? The delicious Chicago made sausages, Avery says, also happen to be made from pastured, heritage hogs who were raised without the use of antibiotics on local farms. Plus, they save you from ever having to decide whether you want bacon or sausage with your breakfast again. Just a few tables down from Avery was another Chicago entrepreneur. He was serving burgers, but not the kind your mother might recognize. “I’m the owner and I work for the Amazing Kale Burger,” said Brandon Byxbie with a smile on his face and turtle green burger in his hand. “It’s an all-vegetable patty, vegan, gluten-free and soy-free--mostly kale and mushrooms, two beans and a grain. Now, for those of you who assume a kale burger can’t taste amazing, you’ll have to try this one for yourself to become a believer. They’re sold at the Logan Square Farmers Market every Sunday as well as four co-ops around Chicago. Also at the Good Food Festival, I found Marek Wolanowski purveying yet another remarkable product, this one called: Amazing Shrimp. They’re sweet juicy Gulf Shrimp raised locally--yes locally-- outside Indianapolis in a clear water recirculating system. So why raise them this way? Chef Paul Virant has already been serving them his restaurants at Vie in Western Springs and Perennial Virant in Lincoln Park. 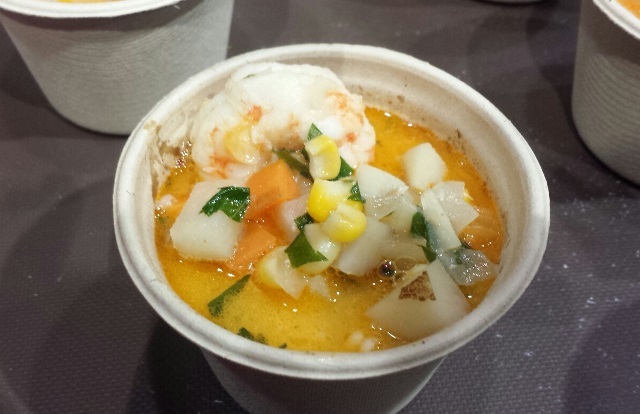 During a shrimp chowder cooking demo at the Good Food Festival he praised their flavor and freshness. Wolanowski says that, starting this spring, the local Gulf shrimp will be on sale at Green City Market. Want to eat chocolate sauce without feeling guilty? Connie Wastcoat at Grown Up Kids Stuff wants to help you with a line of Chicago-made dessert sauces, many of which are made from Ghanaian chocolate. And if you’re not in the mood for a chocolate dessert, how about lentils? At the International Association of Culinary Professionals sponsor hall, I met Delaney Seiferling who wants to change your mind about the humble legume. “Yes, of course, you can boost the nutritional component of your dessert a little by substituting pureed lentils for half of the butter,” she said referring to recipes that can be found at Canadian Lentils. “We usually say red lentils, but any kind of lentils will work." Seiferling’s even packed them into chocolate chip cookies--and fed them to kids. This is something I haven’t tried yet, but let’s just say that my kids are in for lentil-spiked cookies any day now.